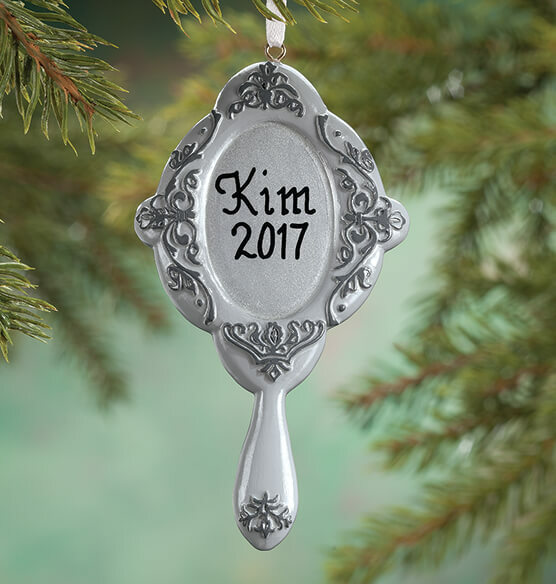 Reflecting charm of a bygone era, this personalized antique mirror ornament becomes a cherished keepsake when personalized in elegant style. Like a treasure from your grandmother's dressing table, the Christmas ornament is wonderfully detailed, and a gift of beauty and sentiment when we add one name and memorable year. Specify name; limit 1 line, 6 letters/spaces. Specify year; limit 4 characters. Resin. 4 1/4" high.